It has finally been done. The last design for the Marshal Street Bridge project has been approved. 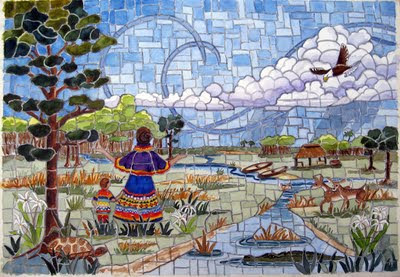 The design honors the Seminole Indians with images of their folk stories. It also shows a picture of our Florida everglades. On Friday Sept. 2nd Kevin and I finished the sculpting of tiles for this mural. Next week we glaze and fire them. All in all there will be around 4,000 tiles made for this project. We are currently looking for a donated space to assemble these murals in the Ft. Lauderdale area. If anyone knows of a nice air conditioned space big enough for an 8' X 11' table workspace available for just a few months please contact us. Thanks. 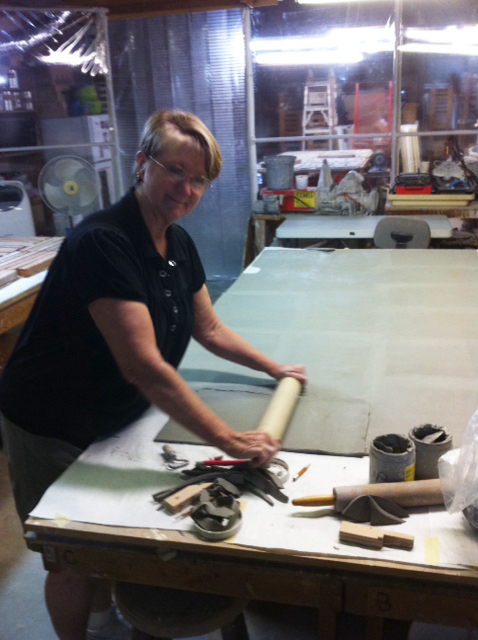 Here I am finishing up the prep work on the slab to sculpt the final 4th mural.